Close to sundown each night, hubby and I have taken time to see our last "ice-out" on the St. Croix River. We first have to take a walk down the hill; we usually use a path off of the riding arena. Can you spot the Foresterman through the trees in this picture? giggle...! It never ceases to amaze me the amount of ice that comes downstream. This year it rained early, so the top layer turned to mush. Imagine ponies snorting as they swim the water ~ thats exactly how it sounded this year as the ice shelved up. 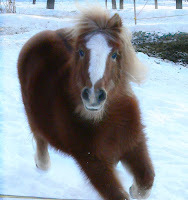 Kind of like Sally, our renegade resident part shetland pony / part baby yak here at Rocky Ridge (yes, shes coming to Montana with us, only if she promises not to climb under any fences...again...or pee on baby's hay...again....or...well, you get the picture :). The river gives up treasures in the spring ~ there was a really neat Black Ash log knot, worn by the water and ice, right by my feet... Actually, upstream from here we worked on a timber reconnaissance project on the river (://dictionaryofforestry.org/dict/term/reconnaissance ) I aged a 200 year old Black Ash tree...Isnt that amazing? we are definitely going to miss the river.